Nikon wanted to introduce the new COOLPIX line with a bang. To deliver on this goal, we created a viral application on Ashtonscoolpix.com that would allow consumers to upload their photos onto Ashton's COOLPIX. What they would see in return was Ashton doing what Ashton does best - commenting on the photos in shocking and hysterical ways. Users could then send the photos along to friends, beginning a viral chain of stunning COOLPIX pictography. Ultimately, the application would drive recipients back to the site so they too could amaze their friends with their incredible photos on Ashton's COOLPIX. Nothing short of stunning will do for Nikon. 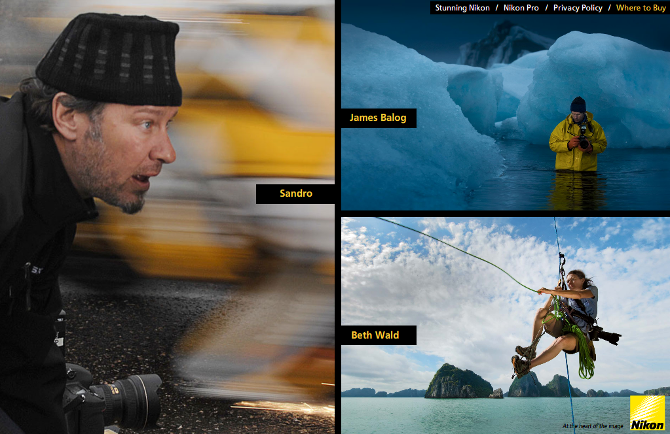 To wow them we developed this website to showcase the Nikon Pro Challenge. For this challenge Nikon sent professional photographers all over the globe to get the ultimate shots and put their Nikon gear to the ultimate test. The website featured remarkable imagery captured by the photographers as well as behind the scenes video diaries and detailed information on how "the shot" was achieved. THE CHALLENGE: Go on assignment to show demanding pros that when it comes to performance and image quality, Nikon sets the standards. THE CREATIVE: If you're going to show pro equipment in action, you're going to have to go where the action is. So for the Pro Challenge, we captured every element of the extreme assignments we gave our famous photographers. With galleries of their favorite shots, behind-the-scenes video documentaries and complete listings of all the Nikon equipment in each photog's bag, we showed image experts everywhere that Nikon is the real deal.